Alpha Cook: Yo Ho Ho and a… didn’t we just buy that bottle yesterday? Yo Ho Ho and a… didn’t we just buy that bottle yesterday? Being on vacation for month is a lot different than going on vacation for just a week. It has consequences. I’m not just talking about the fact that your friends and family secretly judge you; I mean that you can’t go “all out.” So there’ll be no more saying “I can eat what I want, I’m on vacation!” or “It’s OK to eat the whole bag of chips,” because if you did that for an entire month, you might find yourself in a bit of trouble, i.e. not fitting into your swim trunks any more. Most importantly, it prevents you from casually tipping some of that tasty rum into your morning coffee. That’s right, no more breakfast rum. But that’s ok, because lunch hour on the island is flexible. The local rum of the USVI is Cruzan and is produced on St. Croix, the largest of the Virgin Islands, and they’re very proud of it. There is no tax on alcohol or tobacco here so it’s both very cheap and very tasty. 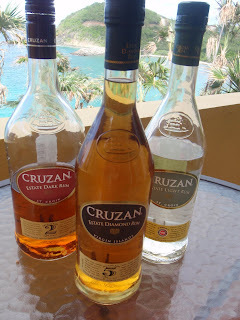 Cruzan makes everything from those silly fruit flavored and cream rums to a more refined single barrel spirit that's sure to go well with a cigar. Blackstrap Rum—this is my favorite rum of the Cruzan line, and makes a dark rum like Meyers look sickly. Tastes of coffee and molasses, with a full body, it makes you feel like a pirate and want to drink straight from the bottle (after 11am of course). I usually drink this either over ice with a splash or OJ or lime, or neat after dinner. 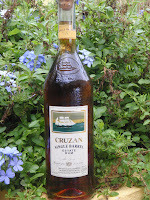 Cruzan 5 Year—this rum is very drinkable and a little harder to find. It’s what I think when I think of rum, which is often. Great with ginger beer or just a squeeze of lime. Single Barrel Estate—be prepared for a full bodied rum that is very spicy; it’s the Bookers of rum, but without the high alcohol content. In fact it reminds me more of a bourbon than a rum. Good neat or over ice. Dark Rum (2 year)—not as dark as Meyers or Blackstrap by far, but good for a basic mixer. I’ve been drinking this in mixed drinks and of course, right from the bottle. Light Rum—I’m not particularly a fan of light or white rums, but sometimes you just gotta have a strawberry daiquiri. Being on an island, I feel that one should be immune to any shame or judgment that comes with frozen beverages. Cruzan Light Rum is actually aged at least 14 months in oak casks, giving it more character and body than the average light rum. Cruzan 151—I had to mention this not because I’ve tried it and would like to recommend it, but because anything prohibited from being taken back on an airplane due to its “extreme flammability” is worth mentioning. Put all ingredients in a double rocks glass with ice and shake or stir well. One last thing—I’m a big fan of sampling the local wares and trying new things. However, I realize that not everyone has the same ideology. After landing at the airport I made a quick stop in the duty free liquor store that’s beside the baggage claim (best idea EVER) to pick up some instant gratification. There was a frat boy sort in front of me who was buying a bottle of Bacardi. Besides the local stuff they must have had at least five different types of rum I had never seen before, but there was Biff, getting his Bacardi anyway. The woman at the counter was heckling him a bit, and I’d say that only 50% was joking. “Why don’t you go back and trade that out for a bottle of local rum,” she finally said, her arms crossed. It was more of a demand than a request, and yet he still resisted. Biff would not be intimidated by the locals. I'd say he really must have wanted that Bacardi, because by this point even I was kind of scared of the woman behind the counter, and very relieved to already have my Cruzan in hand.